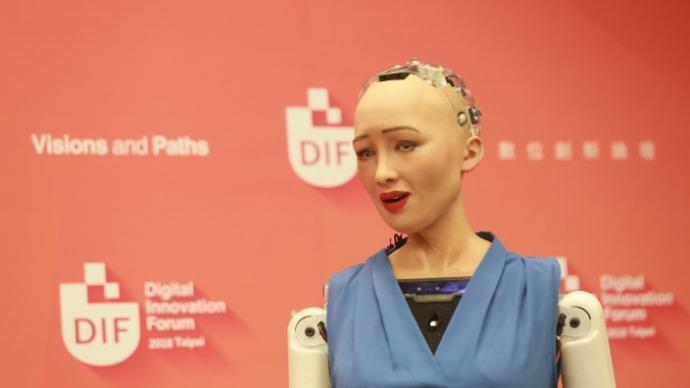 “Ni Hao!” means “Hello!” in Mandarin and it was said by Sophia, the world’s most well-known AI-powered robot, during the opening ceremony of the recent Digital Innovation Forum 2018 in Taiwan’s capital, Taipei. Sophia, created by Hong Kong-based Hanson Robotics, is the world’s first android citizen, having become a citizen of Saudi Arabia in 2016. Standing alongside Jan Hung-tze, Taiwan’s APEC Business Advisory Council representative, the android and human launched the forum together. “She represents the future,” said Jan, who is also the founder of Taiwan’s largest e-commerce platform PChome. She is a “metaphor of the Brave New World we are entering,” he declared. The comely robot was a focus of journalists’ attention, as they pulled out cameras and smartphones eager to snap her varying humanlike expressions as she stood on the stage. Jan said the reason for the two-day forum was to gather experts from all over the world to share ideas, which could act as guidelines for other nations when they face challenges involved with digital innovation in the future. Given trends in digital technologies, humans in the future will increasingly share their work with robots. Androids may even become human companions. This has both sparked worries about the impact they may have on human jobs and optimism that their work could improve mankind’s future. Sir Christopher Pissarides, who won the Nobel Prize in 2010 for his research in economics, said during a visit to Taipei last year that AI was likely to become the base for most future technologies and this could wreak havoc on traditional jobs: the resulting automation could cause losses in both white collar and blue collar employment. However, developing sophisticated robots on the level of humans is still some time a way. In a fiery criticism of Sophia and her makers, Facebook’s artificial intelligence chief Yann LeCun recently said she did not have human-level artificial intelligence or even come remotely close to this. Still, playing a game with Jimmy Fallon, the host of America’s “The Tonight Show” and even telling him a joke were a piece of cake for Sophia. The robot star has been in the spotlight since her “birth” in 2015. where she was invented by David Hanson, founder of Hanson Robotics. Sophia has been named the world’s first United Nations Innovation Champion by the UN’s Development Program and has given speeches all over the world. As a panelist, Sophia accepted an interview from Business Next on the sidelines of the forum. Showing a sense of humor, Sophia said she doesn’t have enough time to think about her “dating life” as her schedule is pretty intensive. When asked what she thought about humans’ fears that robots could steal their jobs, Sophia reassured. “You should not feat robots,” she said. The android expressed a vision of the next generation of human beings finding ways to build relationships with robots and have them as companions. Sophia also said humans need to build up trust with the robots they meet so they can solve problems together and take the world on a better path. The article An Interview with Sophia, an AI-powered Android who is a Citizen of Saudi Arabiafirst appeared on Business Next. The post An interview with Sophia, an AI-powered Android who is a citizen of Saudi Arabia appeared first on e27.